February 1936. "Lucky Street. Mission District, San Francisco. Rent twenty to twenty-two dollars a month for three or four rooms." Medium format acetate negative by Dorothea Lange for the Resettlement Administration. View full size. Submitted by ContextSans on Fri, 11/24/2017 - 8:27pm. Lucky Street only runs two blocks in the Mission, south from 24th, traversing 25th, and dead ending into 26th. One block away from Garfield Square, which I believe appears as background to some of the automobile glamor shots also appearing on this site. 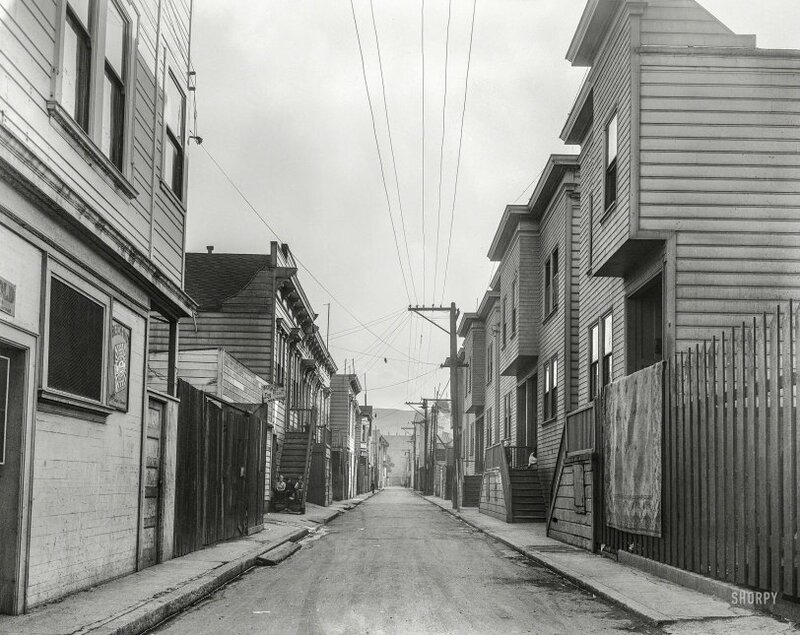 These little alleyways were always cheaper, sketchier housing from the start though - they were originally access streets for single-family homes to take grocery deliveries, and to keep their stables and carriage houses, and to allow access for vaultmen. Fairly early on, folks started building more cheap homes into the backs of these lots, and they're still there today.